The Playground is the brainchild of Chef Jason Quinn, whose gourmet food truck The Lime Truck won of season 2 of FoodNetwork’s The Great Food Truck Race. 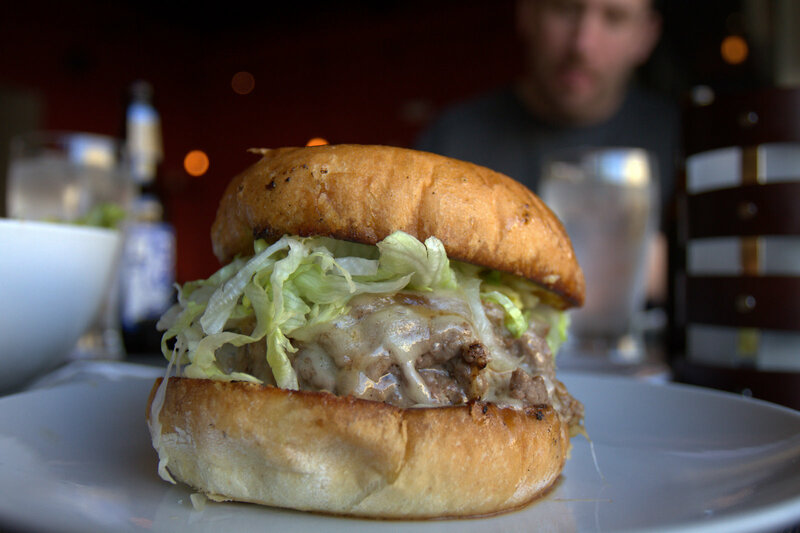 Located across the street from the historic Yost Theatre in Santa, Ana California, the restaurant bills itself as a “craft beer focused” and “ingredient driven” joint that serves “one great burger”. Not to be confused with a “burger restaurant”, the menu here is fit for foodies with a wide variety of cravings. I ran across this restaurant in sort of a backwards way. I was recently headed to Long Beach for a trade show and I did my usual burger scouting ritual a few weeks before on Twitter. I saw a tweet with a link to an article about a restaurant in the LA area where the chef had “dared” to reply back to an angry Yelp reviewer with a bit of snark of his own. It’s not uncommon for restaurants to reply to Yelp reviews. This one stood out because it was in stark contrast to bad Yelp review reaction I read about from a BBQ restaurant in Atlanta a few weeks before. Both owners sort of “lashed out” at the reviewers: the BBQ restaurant posted the reviewers photo on their Facebook page and called her every name in the book and blasted anyone who suggested they might be a little out of line. The Playground replied via Yelp but ended the riveting reply with the line: “Burn in Hell” (only after the reviewer got personal and commented about the chef’s parents). 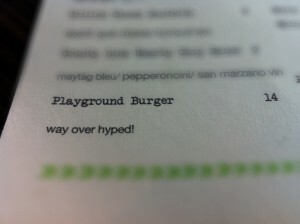 There was something more genuine and compelling The Playground’s reaction that made me look into their restaurant more. To me, this wasn’t a case of flat out rudeness, it was more of a case of overflowing passion for what the restaurant believes in and correcting some inaccuracies in a one sided Yelp review. Not only did the chef *not* back down from his comment, he added a new section of his website called “dialog” explaining his position further. When I read the review reply and the website, I didn’t read “hate”. Instead, I heard the story of someone who is putting it all out there to serve the best food they can in a place they (and their employees) can be proud of. Anyway, as I perused their site, I saw they had a burger on the lunch menu. After a bit more Googling, I started reading some great reviews about it, so I made it my first official stop after I landed in Long Beach. I had already made dinner plans that night with my buddy Joseph (who always seems to be with me on my epic out of town burger adventures), so I had just planned to sneak in a quick solo burger before dinner. Luckily, he heard about my lunch plans and wanted to join in. But I digress. This ain’t a “restaurant review” blog, it’s a burger review blog. It’s all about the burgers here in my corner of the web. And my dear burger friend, let me tell you: the burger from The Playground is serious business. I asked the server about the burger and he mentioned something about a house ground blend of Wagyu brisket and tri-tip cuts. I was feeling under the weather that day, so the words started blending together. I thought, cool, I get to meet the chef and hear the details straight from the source! I figured he’d come out and give me a quick rundown. What came next was a lesson in burger science that I was seriously honored to have witnessed. I asked him if I could shoot some video and he said “sure”. 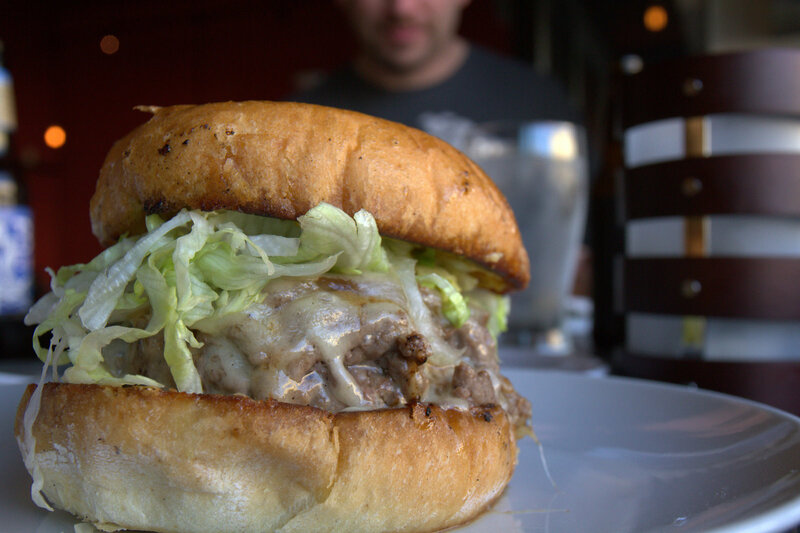 One of the questions I get asked a lot is “What makes a great burger?”. Besides the often overlooked bun aspect, the thing that separates a “good” burger from an “OMG that’s AMAZING!” burger is the beef! Some of the best burgers I’ve had have come from places that put a laser focus on the quality of beef that goes between those two buns. The Playground Burger is no exception. Besides starting with the ultra marbled Wagyu beef, they also went with the best cuts that you dream about when heading to your favorite steakhouse or BBQ joint. I’m talking rib eye, tri-tips, brisket. The meat alone on this burger is probably better than some fine dining restaurants. The preparation of the burger is seriously over the top. I can’t even describe it here, just watch the video 2 times. Maybe 3. The end result is a quality that I’ve found in almost all of my favorite burgers. I hate to use the word “mouthfeel” for a burger review, but there’s definitely something smooth and buttery about each bite. The toppings all went to compliment the juicy beef flavors. A maple bourbon onion compote, shredded iceberg lettuce, scratch made mayo, scratch made mustard all come together to shower the burger with flavor gifts. The bun is their own recipe that they sometimes bake in-house, but most of the time contract a local bakery to prepare for them. It had horseradish IN THE BUN! I can’t tell you how much I love horseradish, and although you can’t really taste it in the sandwich, the chef explained that the horseradish element designed to help make your taste buds receptive of the other flavors headed their way. It’s hard for a burger to wow me these days, and this burger was an amusement park for my mouth. This was a slow play burger if I’ve ever had one: I tried to eat is as slow as possible because I didn’t want the experience to end. I liked it so much I tried to get back there one more time before I few back to Sacramento. I was going to make a quick jaunt into Santa Ana after the trade show ended, totally sans camera, so I could slowly enjoy the burger one more time. Unfortunately, my timing didn’t work out, so I had to settle for some great BBQ in Long Beach. Let’s put it this way. 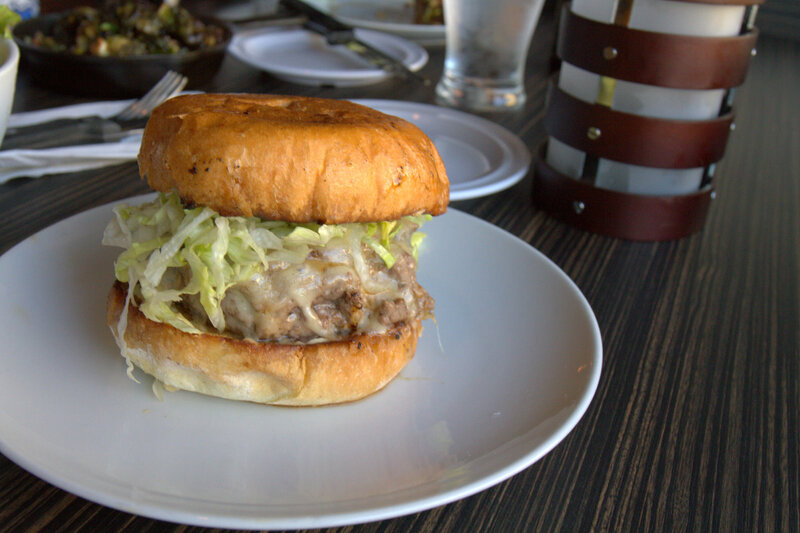 I sometimes like to rate burgers (and good food) based on how far I’d drive *just* to have that meal again. The Playground Burger is about a three fitty-400 miler for sure. 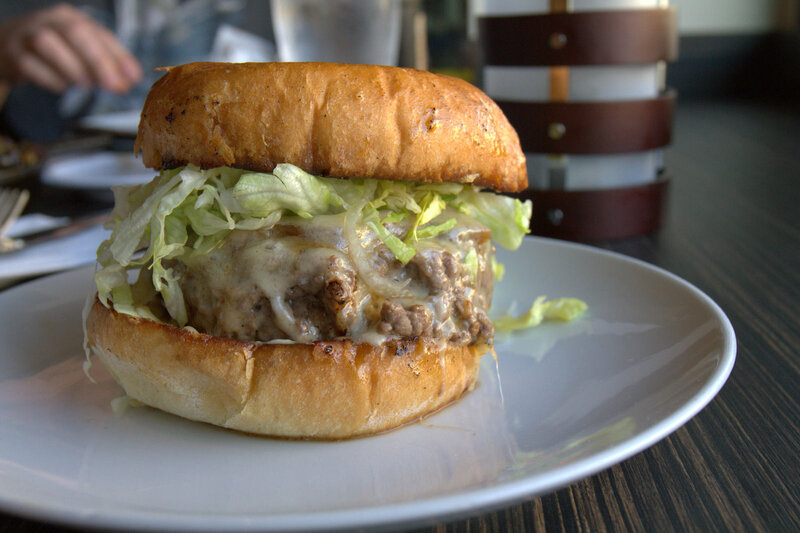 This burger is your favorite burger’s favorite burger. 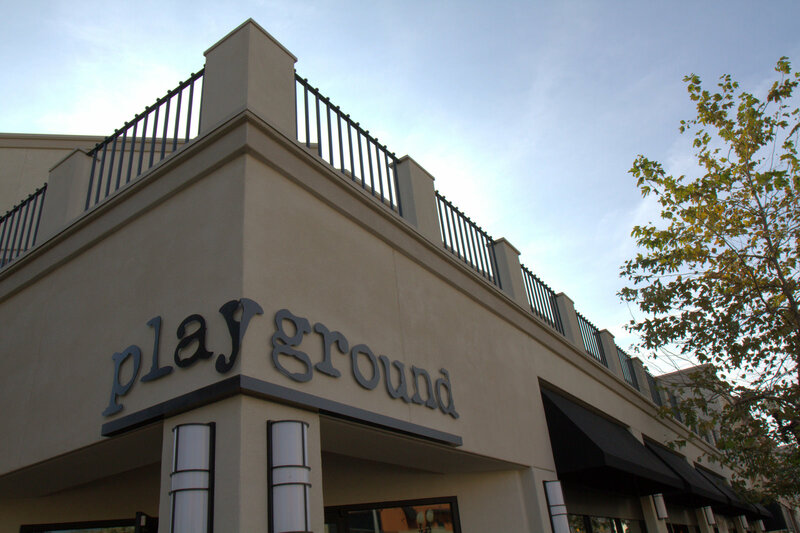 The lunch and dinner menus at The Playground changes as different ingredients reach the peak of their freshness. Keep an eye out on their active Twitter and Facebook pages (or their website) to see if the burger makes an appearance again. If it does. Go eat it. It doesn’t come with fries and it doesn’t need ketchup. I may have just added to the hype, but this burger deserves it. Awesome review of what sounds like heaven on a bun. I’m sitting here salivating while trying to calculate how far Santa Ana is from Memphis. Keep up the awesome work! I got lost in the articles surrounding this restaurant’s yelp fiasco. I enjoy hearing about businesses/people that stand up for their principles. I love people with passion. I would GIVE this cat my time and talents riding on those two facts alone if ever given the chance. Same here, Rachel. I spent about a half hour reading the whole Yelp fiasco and felt totally more connected to the restaurant instead of put off. I seriously felt honored to hear such a thoughtful breakdown of the burger’s journey to my plate. So happy I caught it on video! 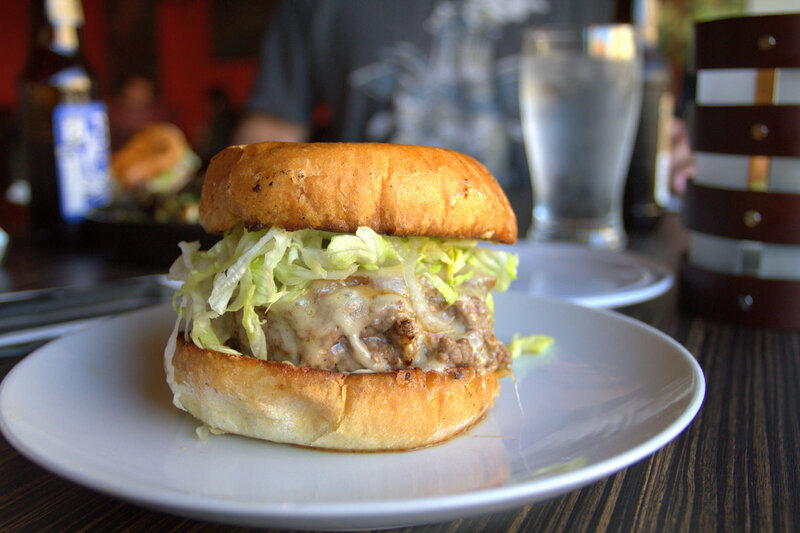 Hi Rodney – This burger is AH-MAZING. My husband and I went to The Playground just to try this burger. 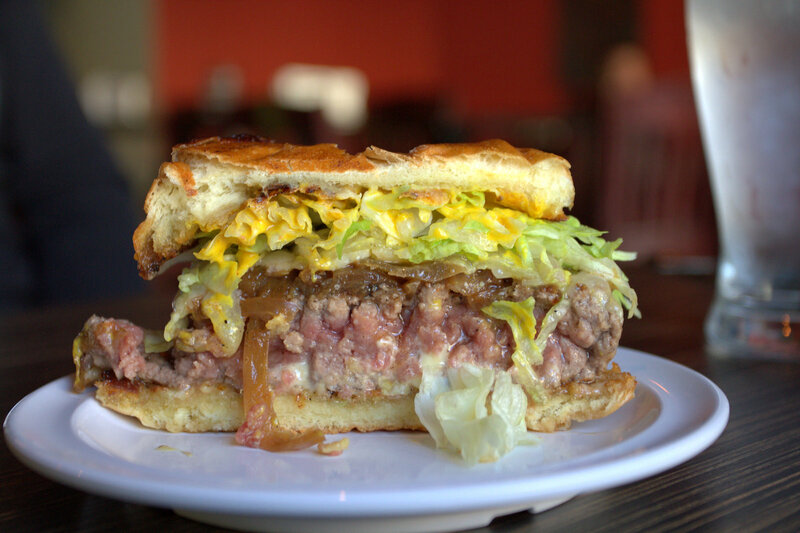 This burger is no longer on the menu at Playground and is instead across the street at the 4th Street Market at Wagyu Steak (so, rest assured, you are safe driving the 350-400 miles to have another one). After a few delicious appetizers at Playground (the brussels sprouts caesar salad is a life changing experience) we ventured across the street and shared one. An added bonus was being seated next to Chef Jason, meeting him and chatting about our respect for his amazing creativity. In fact, as we sat next to him, he was menu planning for the next day. Cool stuff.